Christmas is over and done with, and I hope everyone had a lovely time with your families and lots of good food! I think I'm still suffering from a post-Christmas food coma! 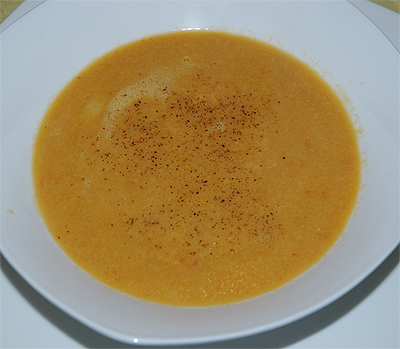 This soup I made as a starter for our Christmas dinner, but it'll make for a delightful starter to your New Year's Dinner menu or for future dinner parties. Don't let the word bisque scare you. 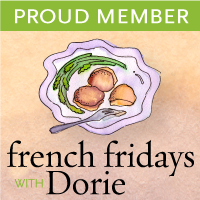 It may be French and fancy-sounding, but this soup is incredibly easy to make. Granted, it doesn't have the same, silky-smooth texture of a traditional French bisque (unless you strain the soup again after the second purée), but I quite like the slight chunkiness to the soup—it makes it a little more rustic. 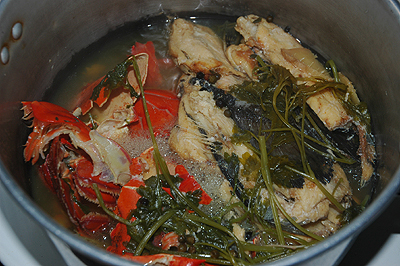 If you have leftover fish bones or shells from lobsters and shrimp, throw them into a pot and make your own seafood stock. You'll get a richer, more robust flavour to the the soup than if you used chicken stock from a can. It's a bit more work on your part, but trust me, you won't regret it! To make your own seafood stock, place fish bones, lobster shells and the reserved shrimp shells in a medium stockpot along with 5 to 6 cups of water, a couple of black peppercorns and some fresh parsley sprigs. Bring to a boil, and then reduce the heat to medium-low and simmer for 2 to 3 hours. Strain the stock; discard the shells and bones and set the stock aside. Alternatively, heat the olive oil in a large saucepan over medium heat. Add the onion, carrot, and garlic and sauté until the shells are bright pink and the vegetables softened, about 5 more minutes. Add the tomatoes and the stock and cook until the tomatoes are softened and the stock is aromatic, about 5 minutes longer. Remove the shrimp shells and discard. In a blender or food processor, process the mixture in batches until finely chopped. Pass the finely chopped mixture through a fine-mesh sieve or food mill set over a soup pot, pressing on the solids with the back of a spoon. Discard the solids in the sieve. 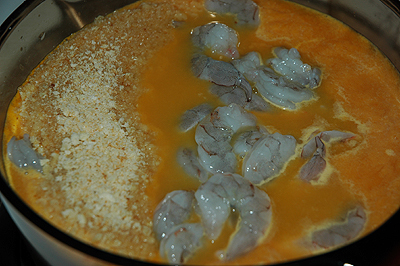 Reserve about 24 shrimp to finish the soup and add the remaining shrimp and the breadcrumbs to the pot. Cook over medium heat until the shrimp turn pink and are opaque throughout and the breadcrumbs have been absorbed, about 3 minutes. Remove from the heat. In the blender or food processor, purée the soup in batches until smooth. Alternatively, process with a handheld blender in the pot until smooth. Return the purée to medium heat and add the cream, sherry or brandy, salt and pepper to taste, and the cayenne pepper, if using. Cook for another 2 minutes to blend the flavours. Taste and adjust the seasoning. Cut the reserved shrimp into 1-inch pieces. Just before serving, turn the heat off and add the shrimp pieces to the soup. Cook until they turn pink and are opaque throughout, about 1 to 2 minutes longer, stirring the shrimp through the hot soup to help the cooking process. Ladle the soup into warmed bowls and garnish with the parsley. Serve immediately. Posted by Bonita at 8:02 p.m.